how do i mine this coin? how about this project now brothers? Is it still update their work? what exchange can I trade this token brothers? you can trade on stocks exchange project is full working devs keeping their promisis! On the official launch of BankCEX, we would like to announce that the Withdrawal Function will be disabled from 5 days to one week after the releasing date. This decision is taken to assure that everything on BankCEX is well operated. After this period, WD function will be enabled to all users on our Exchange. Please help to take note and spread this news to your friends. they are really paying me each day from their profits. Hello, An interesting idea, just wonder how do you differentiate from other existing payment systems and how would you ensure that there will be a big enough adoption of your system in order to make it sustainable in the long run? As we have announced before, the first 10 coin/token submitted to BankCEX will be listed without no fee if they pass our review process. In fact, we have received more listing requests from different crypto projects than we thought. Thus, BankCEX team has decided to expand the number of free listings to 50 coin/token. If you are a dev or owner of your coin/token, please don’t miss the chance to get free listing on BankCEX. Nearly 38 slots remaining for free listing at the moment! This program is also conducted as one of our marketing steps to expand and strengthen BankCoin community. After the free listing gets over, we will apply the listing request with fee. At this time, 30% of the listing fee will be added to the to the sharing profit. This sharing proportion can grow higher because we have found and developed a new approach to operate BankCEX Exchange at the lowest cost. Please give us more truth and confidence as you have done so far. If some tokens/coins want to gel tisted on BankCex, do they need to win the voting or to pay some payments? BANKCOIN is a good investment for beginners. This tokens will be quite expensive. The project needs more time for the pr campaign and the ico campaign to be expanded. For the first 50 coins it is free and without voting. The bankcoin team will review the coin project. Greeting from BankCEX Exchange – a Digital Asset Exchange at world class standard. There are a lot of exchanges in the cryptocurrency market today, which makes you think that you have many choices of where to list your coin/token. However, it’s the fact that most of them usually charge you highly with the fee up to 100 BTC sometimes and you can be easily delisted if don’t pay for the maintenance fee as some exchanges’ rule. As the first observer to this matter, we are providing all cryptocurrency projects the opportunities of listing on BankCEX without fee. But the key motivation behind this program is not the mentioned-above matter. As people may know, BankCoin also got started as a new cryptocurrency project at the beginning. Thus it’s easy for us to understand that it’s difficult to get listed on a qualified external exchange unless paying a considerable amount of fee for a beginner. In fact, other exchanges do not pay much attention to who the founders are, what their vision is and how potential a new platform is. In stead, who those can pay the fee will be listed. Free listing program for coin/token from qualified cryptocurrency projects on our Exchange. The previous program’s limit of 50 coin/token has been removed with the hope that as many healthy cryptocurrency projects can get listed on our exchange as possible. We will keep the program running after this announcement. Adjustments will be delivered if any. Why this is a good choice for you? • Trade your coin/token is a dynamic and powerful exchange built under the standard of world class cryptocurrency exchange. • Introduce your coin to a community of 200,000 + members. ~ BankCex daily sharing of the revenue for reimbursement. • Contact us for listing process. ~ Maintain a minimum volume of $ 500 per day for token. ~ Maintain a minimum volume of $ 1000 per day for coin. • Put BankCEX logo on your official website and make announcement to your community. 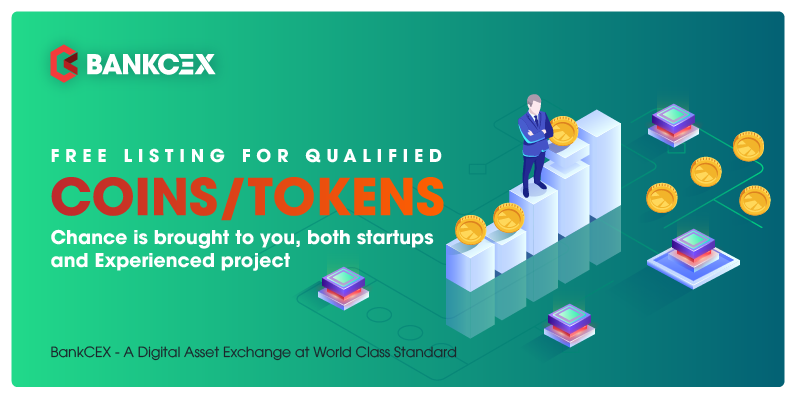 Please reach here to create a account to submit your coin to our exchange: https://info.bankcex.com/index.html right now! We do appreciate your attention and would love to hear from you soon. incredible idea I think with the allocation of funds on each item quite a lot, the sale of coins also offers many bonuses and benefits as well, I also see this plan developed an airdrop program, where I can see the thread about it? What do you want to study more about us? Anyway, if you have any questions, please reach our social channels for more support. Please join our platform and discover more about us. Do you want to enjoy BankCEX whenever and wherever you want? Well, it’s been ready for you. Now you can trade your cryptocurrency on the Go with the Android Apps we's created for your mobile. The new arrived Apps is not all to enjoy today. In some next hours, BankCEX Trading Bot will start to work on BankCEX, which helps to increase the trading volume, thus don’t be surprised if you see a huge increase on the trading volume. Quick note for you: The Withdrawal Function is temporarily disabled until our trading Bot run well. It means the function will be back some next days. Please kindly wait. Once again, we have proved so many times, our mission is to build a platform that will help all of us to reach financial freedom together. 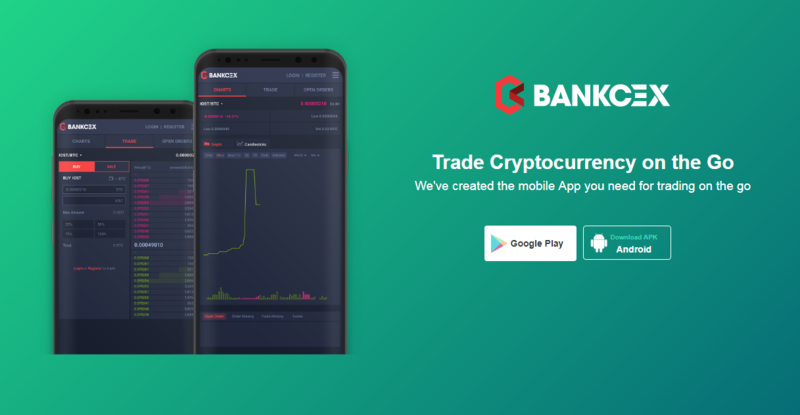 BankCoin – BankCEX team keep moving, growing and never sleep. We can see that this destination seems to be no longer far away from us from now. Thanks so much for your love and faith to us upto the present. Team of Bankcoin - BankCEX. The fastest and most powerful ecosystem in 2018 . I love how the team focuses in delivering high quality and secure products rather than unnecessary hype and fake promises. Hope other projects could learn something here! Wow this project is very good. All the people who work here will be run because this is especially easy if you have facebook, twitter, and instagram. and much more. I recommend everyone to pay attention to this team. Thanks for the encouraging words. If you're in love with us, please join our platform with multi projects running. We will not let our users upset and have proved many times that action speaks better than voice.